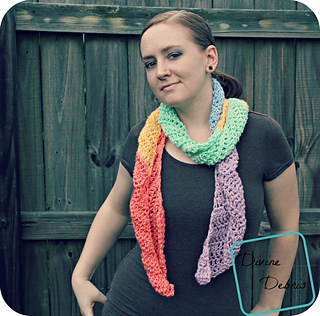 This is a super easy scarf, just your basic dc scarf. Working in rows, with decreases and increases, allows you to get a natural twirl to your scarf. 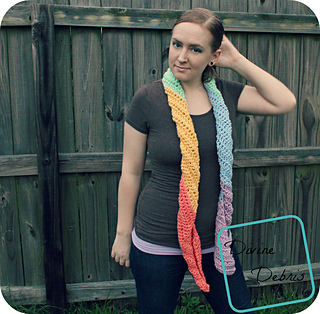 This scarf is easily customizable, with colors or making the scarf longer/ shorter or wider/ thinner. 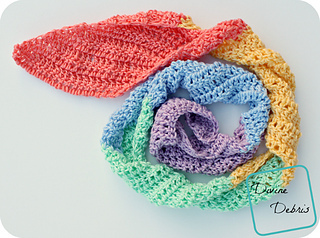 Sure, it’s kinda another simple dc scarf pattern, perfect for a quick gift or fun scarf for yourself, but the finished product isn’t boring or typical. Copyright @ Divine Debris 2012 - 2015. No part of this document may be reproduced or transmitted in any form by any means, electronic, mechanical, photocopying, or otherwise, without prior written permission from the author. Sales of finished product are permitted, but designer requests that you link back to pattern and credit Divine Debris with the original design under the Creative Commons Attribution-Share Alike license. If you have any questions, comments or concerns please contact info@divinedebris.com.